7th CPC : Enhancment of Minimum Pay from Rs. 18,000 to Rs. 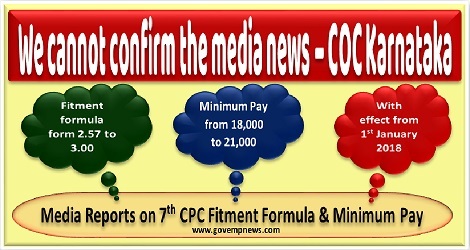 21,000 & Fitment Formula from 2.57 to 3.00 from January 2018 - Confederation not confirmed the news, 7th CPC Minimum wage and fitment formula in hike issues – COC Karnataka, Comrades, There are various reports in the news media, print media & social media regarding the hike in the minimum wage of Central Government employees from the existing Rs 18,000/ – to Rs 21,000/ and fitment formula from 2.57 to 3.00, which shall be implemented from 1st January 2018. The same shall be announced in the National Anomaly Committee due on 9th of October.